.318'' groove No.4 Enfield, what bullet to use? AMMUNITION RELOADING DISCLAIMER: Any and all equipment, materials, and data mentioned on our boards are for informational purposes only, and are not intended to promote or endorse any particular products or technique. Any and all recipes, techniques, and data are to be used at your own risk. We accept no responsibility for the use or misuse of any information found on this wed site. Please Note: All reloading activity should be done in strict accordance of the manufacturers' specifications printed in their manuals. Milsurps.com and it's members will be held harmless of any and all information related to reloading data and the use of any ammunition submitted on these boards. Due to the age and unknown maintenance and modifications of ex-military weapons there is always an inherent risk of personal injury including death, even when properly loaded ammunition is used. Inherently, reloading ammunition can be dangerous even in new weapons - Adding to this ammunition risk, many milsurp weapons are often well over half a century old with no knowledge of their maintenance and modifications over the many years while in civilian ownership. Milsurps.com does not endorse or take responsibility for discharging any weapon. Thread: .318'' groove No.4 Enfield, what bullet to use? Own a early N0.4 Mk1 Fazakerley Enfield Rifle that I am getting ready to load for. The bore is a near mint 2 groove. Thought I would start by slugging the barrel before ordering up some bullets. Lubed the bore & a lead .314'' diameter pistol bullet, and ran it down the bore. The bullet measured .304"+(not quite .3045") by .318"+(again not quite .3185"). Measured with a good vernier caliper and a micrometer. To be sure I read the bullet 5 times. And just for good measure, ran a second bullet down the barrel and measured it. The results were the same. I have yet to shoot this rifle, though I have owned it for over 5 years, so do not know how military or commercial ammo would preform from it. The question I have is should I use a bullet like a jacketed 'J' bore 8mm Mauser bullet .318"diameter? What size cast bullet would be best? Thinking a 175 jacketed 'J' bore bullet would be best weight wise, so as to keep the load in the same weight category. Any advice would really be appreciated. Man that’s a big bore on an Enfield even my worn out ones slug better than that. .318 J Mauser bullets would be where I start. Cast would probably take a custom mould of your choice in the .319 to .320 range. Weight in cast is not as big a deal to me because you can’t match the velocity. I’d ask if your confident on your measurement but it sounds like you are. I would be very careful using the Woodleigh .318 bullet . A long groove diameter bullet with your very deep rifling will cause massive pressure spike . Also with a big cast bullet the rifling will cut the bullet deeply and affect accuracy , depending on what you are looking for in accuracy . I would try a Hornady .312 174 round nose bullet at a medium velocity . It should grab your .304 lands and should stay straight due to its long cylinder shape . Speer did make [ a long time ago when Speer KNEW how to make bullets for military rifles ] a .313 215 grain round nose that does work great . They can still be found here and there . a .318" bullet in a .303" chamber will be a jam fit and can cause high pressure since the case neck cannot release the bullet. 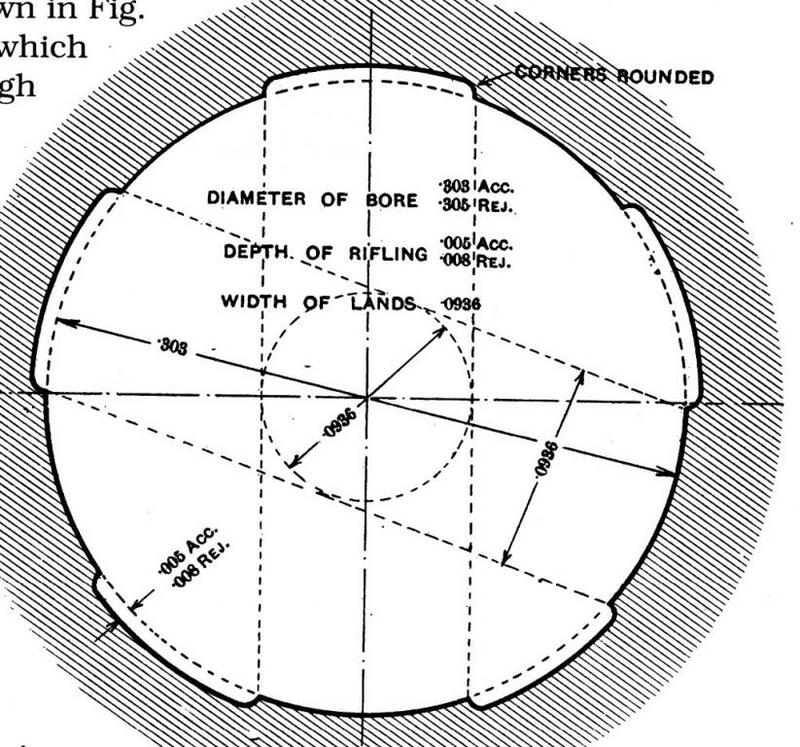 A .318" groove diameter isn't really all that uncommon. If the attached engineering drawing (source?) is credible, it's actually within specs. Before venturing into oversize jacketed bullets, it would be worthwhile to try normal .311" to .313" projectiles. You might be pleasantly surprised. As for cast, I've tried unsized bullets dropping ~.316" in my 2-groove Savage that goes about .304"x.318". Accuracy isn't great but OK for short-range plinking and practice. Last edited by Parashooter; 04-14-2019 at 11:52 AM. A .318 bullet in a .303 chamber would only be a problem if you could not close the bolt cleanly . It may , that would depend on the dia of the chamber neck . The neck having to " expand to release the bullet " is BS . It does not expand when you pull the bullet out with pliers by hand . BS? Now that is a technical acronym I am not familiar with. Please explain in more detail. "Close the bolt cleanly". Please explain. As to the neck not releasing the bullet and running up pressure it is discussed in "Hatcher's Notebook" and was determined to cause high pressure. Hatcher's jamming a case mouth into a bullet is not the same as the neck having to expand to release a bullet . It was all explained in an earlier post . Maybe someone will link to it for you . I think there is a lot of great information out there on reloading, lot of ideas and lots of opinions. That said, I would certainly hope we all could look at each and take what we want and disregard the rest but do it in a respectful manner. With those ideas and opinions there are also lots of personalities and we need to take that into consideration when we make our posted replies. So, please everyone be respectful of others and let’s all enjoy the wonderful abundance of information available here. "We're surrounded, that simplifies our problem!" Will a fired bullet hit the ground at the same time as a dropped bullet? 2 versus 5 groove, date of manufacture, sight type for no4 mk1 enfield?